The dough for pie crusts isn’t difficult to make, but it can be tricky to perfect. The idea crust will come from a dough that has visible chunks of butter (or of shortening) still in it after cutting in the fat. 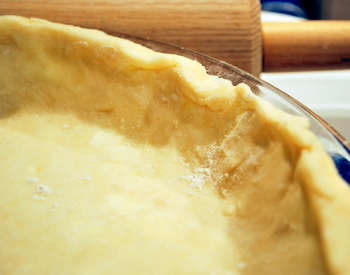 These fat deposits are what make pie dough extra tender (from shortening) or flaky (from butter) during baking. When the dough is rolled out and those pea-sized pieces of fat are rolled out into thin layers as the pie crust is formed, they sometimes come through the dough and stick to the rolling pin.. This can be avoided by really working in the butter – a technique that, while very easy, leads to a tough crust – or by using an easy pie dough-patching trick that will keep butter in its place in a crust that is full of larger pieces of crust-enhancing butter. The trick is to use flour. A lightly floured surface keeps a moist dough from sticking to a rolling surface, but a well-placed pinch of flour added to a sticky spot on the dough lends just enough resistance to keep a softening fat in its place inside the dough. The flour also attracts moisture, so once it is in place it becomes a part of the dough, rather than an add-on that will just brush right off later. This same trick works for puff pastry dough, if you are making it by hand and having a hard time keeping all the butter inside of the pastry as you roll it out. If you manage to turn a sticky spot into a small hole or tear, you can patch it by moistening the edges of the tear with a damp finger, then sprinkling on a little flour and gently pressing the edges together. This kind of seal will not make the dough tough and should hold together long enough to get the crust into the pie plate and into the oven to bake. 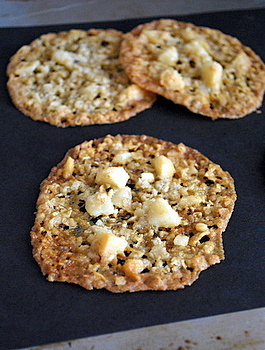 Yeah – that buttery dough is really tough to work with. One trick I like is to chill it right after it’s mixed for a few hours. Then chill it again once it’s rolled out, before you bake it. Not only does it make those chunks of butter much easier to deal with, it really makes the dough so much flakier. I think doughs, in general, are hard to work with, so this tip comes in handy for me. You have such great baking tips and recipes. Your site is always a source on inspiration! If the holes/cracks are small enough, quickly beating an egg and spreading a little of it over cracks/holes while the crust is still hot out of the oven does the trick too.